by Bible. N.T. Greek. 1642. Cantabrigiae: Ex officina Rogeri Danielis, 1642. Folio (37.5 cm, 14.5"). ,  ff., 766 (i.e., 764) pp.,  ff., 125, [1 (blank)] pp., , [1 (blank)] ff. In 1565 Theodore Beza (1519–1605, also de Bèsze or Bèze), Calvin's chief assistant and successor as leader of his reform movement, first published his edition of the Greek New Testament with the Vulgate and his own Latin translation. For the edition of 1582, he revised his text based on the discovery of the important Codex Bezae (Codex D), a manuscript of the Gospels and Acts probably written in the 5th century and the principal witness to the Western textual tradition of the New Testament. Beza personally owned this codex and presented it to Cambridge University in 1581. 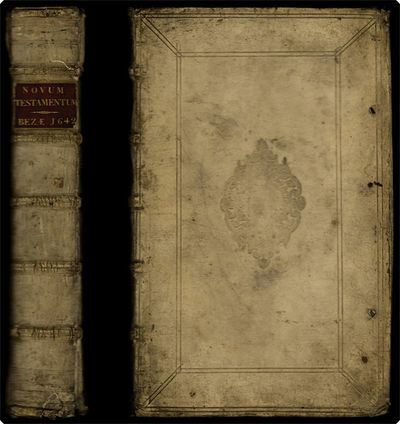 This is the first folio edition of the Greek New Testament to be printed in England as well as the => first Greek–Latin edition of Beza's New Testament to be printed there. It is also considered by the ODCC to be the best edition of Beza's Latin translation of the New Testament. The text is based on Beza's fourth (and last) edition of 1598 and includes his annotations. Joachim Camerarius's commentary on the New Testament is appended at the end with its own sectional title-page and pagination. Handsomely printed with an => engraved printer's device on the title-page by Wenceslas Hollar and woodcut initials, head- and tailpieces, this edition has the text in three parallel columns (Greek, Beza's Latin version, and the Vulgate) with a wealth of commentary above and below. The title-page exists in three states: the present one is printed in black only and lists the print-shop of Roger Daniel without "Londini venales prostant." Provenance: 1710 ownership signature of "R. Holde[----?]." Later in the library of American collector Albert A. Howard, small booklabel ("AHA") at rear.